Have champagne tastes and a beer budget? Craig’s list can help with all of your home-building material needs (if you follow a few smart tips). OK. I admit it. I am a Craig’s list addict. I have bought (and sold) so many items that I’ve lost count. But, the biggest compulsion to surf the listings has come from my extensive house renovation and the need to buy lots of materials—soup to nuts—on the cheap. How else could a Franco-file like me who loves Provence-style architecture and décor acquire reclaimed terra cotta tiles from a French chateau for one-tenth of what they cost in the real-world? Or, get a Liebherr fridge for hundreds, instead of thousands of dollars? Or, get nearly a whole house’s worth of stain-grade, arched French doors and casement windows for $500 total? Craig’s list. But, this free listing service is not without its downsides and pitfalls. Of course, there is no return policy on Craig’s list. Whatever you buy is yours to keep—or resell as the case may be. And, of course, there’s the human factor. Most people are honest and trustworthy, but some just aren’t. Craig’s list killers aside, most people are regular folk just like you and me. But, you do have to keep your street-smart commonsense radar on high. (See sidebar for safety tips). This is all about getting deals—not steals. Disclaimers aside: Over the years, I’ve had a great time shopping, scored some awesome stuff and have met some interesting, quirky, fun people to boot. I’ve also made some mistakes, bought some duds and have therefore, discovered a few how-to tips to getting what you want—in great condition—for less. Here’s a list of some of my top tips. Tip No.1: The More You Can Surf, the Better. Remember Tom Hanks’ desert-island character in the movie “Castaway”? He got up every day just to see what useful stuff the tide would bring in. Think of searching for stuff on Craig’s List the same way. Check online first thing in the and before you go to bed. And, sometimes you’ll be surprised what you can find any time during the day. If you’re one of the first to call about an item, you increase the odds that you’ll score it—especially if it’s a really amazing bargain. TIP No.2: Know How to Search. The best spot to look for home materials is in under “Materials” in the “For Sale” items section. If you want the best deals, search only “Materials by owner.” This will filter out many (but, not all) retail stores using Craig’s list as a free advertising tool. When plugging in key words, you may want to keep it broad. If I’m looking for an arched door, for example, I’ll plug in “arch” to expand the number of items that will come up. Some people don’t use the term arch, however, so you can also get creative and plug in “rounded” or “curved” or even “circle.” I’ve happened upon some interesting materials that I likely wouldn’t have found just by running down the full materials list because I misspelled them. Intentionally misspelling a keyword can sometimes bring up a gold mine. Tip No.3: Do Your Homework. Remember, you’re on Craig’s List for the deals. It doesn’t make sense to buy from this listing service with all of the risks involved (again, there is no return policy) if you’re not paying substantially less than retail. So be sure to know what stuff costs in the real world. Don’t know? Google it. And don’t just google one store. Google a couple to get a good range in price. Tip No.4: Expand Your Search. Didn’t find what you need? Try looking in a different, but nearby city. The list is located at the far right of the main page of Craig’s list. Occasionally, your search will include (at the bottom) items from nearby areas anyway. If it’s not too far, it may be worth the drive. And it never hurts to ask the seller if he or she will be in your area, or wouldn’t mind meeting you halfway. You won’t know unless you ask. Tip No.5: Don’t Fall for This Hummer Trick (I Did)! I once purchased a waterfall faucet from a seller who met up with my husband and I in a park. He arrived in a shiny, new Hummer and seemed bent to impress us on talking about his wealth, including mention that his backyard was as big as the park we were meeting at. That should have been a red-flag right there. He told us the faucet he had (still in the box), which he displayed to us in the back of his pretty hummer, cost in the thousands. I wasn’t so sure and should have trusted my gut. I said “no” at first to the deal. My husband tried to negotiate a lower price. The guy hotly disagreed and then, drove off, only to return a minute later, agreeing to the lower price. We bought the faucet for the lower price, but it was no deal. A google search of the brand later proved we overpaid by $40 retail. What a shame! We won’t do that again. The tip here: Know what stuff costs ahead of time and trust your instincts. If something doesn’t feel right: Walk away. Tip No.6: Check Out the Free Stuff. Craig’s List has a “free” section under all “For Sale” items. This is a place where people just want to get rid of stuff. Often, they’ll put their goods in an alley or on their front curb and send out a Free Curbside Pick Up Alert. I got two truckloads of river rocks for free once by finding one of these postings. A property manager of a ranch in Malibu was looking to do some landscaping and clear the property of rocks. My husband and I rented a truck and acquired several tons, which we later used to build a custom waterslide and waterfall in the backyard. We nabbed for free, what would have cost us thousands from a building supply shop. Tip No.7: Negotiate, Negotiate, Negotiate. Hey, this is Craig’s list, not Home Depot. You’ll never know how low someone will go in price unless you ask. Often, sellers just want to get rid of their stuff to clear out space and they’re happy to see it go. Or, their wives are. Don’t underestimate the power of a clean garage. We once negotiated free delivery because the item (an entire kitchen’s worth of cabinetry from a showroom display from a store that went out of business) was being stored at a facility that was costing the seller money every month. He delivered it for free just to empty out the storage unit! Also, keep in mind that Craig’s list shows when an item was posted online, so you may have more negotiating leverage with a item that’s been online for awhile. While listings get deleted after seven days and have to be reposted, you’ll begin to notice items that haven’t sold because you’ve seen their listing reappear for weeks or even months. Tip No.8: It Pays to Have a Truck. Our family has a Jeep, not a truck. So, some big building materials we’ve purchased have required that we rent a pick-up. Home Depot rents trucks by the hour, but it may take you several hours to complete your delivery. To get a house-worth of windows and doors, we had to rent a pretty big U-Haul. 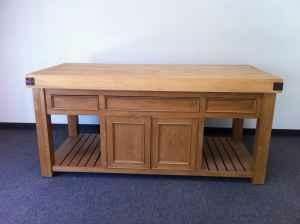 But, we once picked up a seven-foot kitchen island (see pic below) by renting just the trailer. They cost just a fraction of what a vehicle costs (ours cost just $15 per day) and there’s no mileage fee. But you will need a trailer hitch that can pull it—and be somewhat coordinated to pull, park and maneuver them, especially if you need to do a lot of backing up. You should also factor in weight. Items, such as stone, bricks and even roof tiles are heavy and the vehicle you have—or rent—needs to be able to handle the total load, which can easily be several tons. Not just any pick-up can handle a ton. When you consider the cost of an item, always consider transportation. How much gas is it going to cost to get you there and back? Add that to the cost. And, of course, if you have to rent a vehicle, that fee could be significant. • Don’t go alone. I always bring my husband with me and he’s 6’4”. He’s an engineer by education, but he’s also an actor. The parts he gets cast for are Russian mafia hit men, prison wardens, executioners and cops. The dude is scary so people don’t mess with him. If you have a friend like this—bring him along. • Meet in public places when you can. For smaller items, meet up at a public place where lots of other people are located. Any Starbucks parking lot is often a popular meeting spot—it’s where we picked up a range hood once (see pic below). Only meet at a park if it’s a busy one and it’s not at night. • Always bring your phone (with the seller’s cell phone number programmed). Sounds like a no-brainer, but it helps when you call the seller just a few minutes before you arrive at a meeting location to give them a courtesy ETA (or if you’re running late in traffic). (How many people say they’ll be somewhere and then flake? By calling when you get close, you convey to the seller that you’re one of the “descent” folk.) You can also call if you just can’t find your meet up location and need some help. Word to the wise: Always ask what kind of car they’re driving so the two of you don’t sit in a parking lot looking for each other. We met up with a Craig's list seller at this Starbucks in Bakersfield to acquire a brand-new stainless steel range hood--still in the box. New it costs nearly three thousand (we checked at Best Buy the night before), but we got it for $500. It was a wedding present for the seller, but didn't fit his island range, so he just needed to free up space in the garage. We couldn't find a range hood that would fit our kitchen on the Los Angeles postings, so we had to expand our search to Bakersfield. Sounds like a long drive (it was an hour and half), but we combined it with a family trip to the Kern River. See below. Here's our huge kitchen island--another bargain on Craig's list. It fit my Provence-themed kitchen decor, but at seven-feet-long, this was one mighty piece of furniture to transport. In this case, we rented a trailer at U-Haul for $15. Cheaper than finding a truck big enough to move this.